Hi everyone! It’s almost Valentine’s Day, and I realized that I need to share a treat container tutorial with you. Why? Well, because I love treat containers and because this one is so easy! Now, if you are not a fan of Valentine’s Day – fear not! Choose some different colours and this project will be perfect any time of the year! One of the great things about this project is how easy it is to pull together. 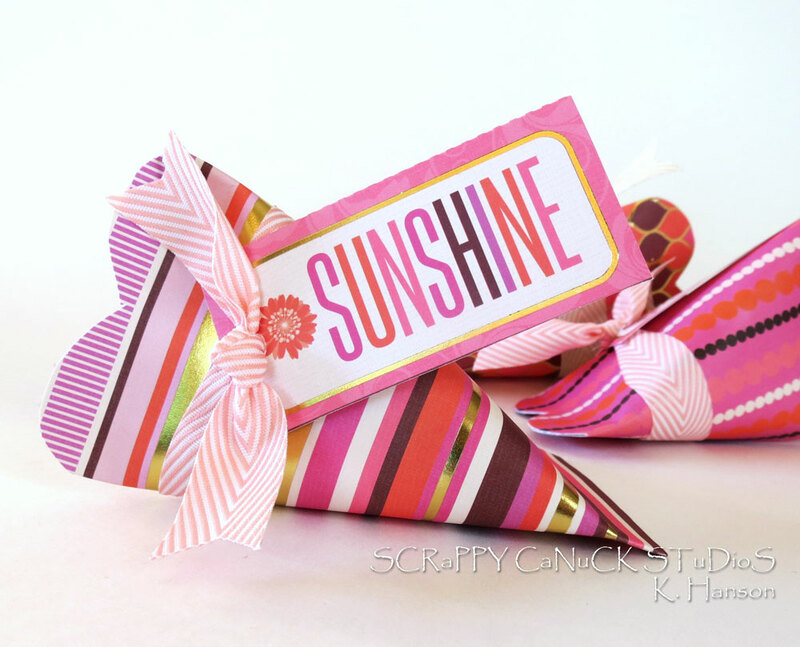 With a single piece of patterned paper from the Haute Pink stack (or any other stack you love), some Scor-pal adhesive and pretty May Arts ribbon, you can pull these together in under 5 minutes. Here’s a quick video to show you how! So whether you are celebrating Valentine’s Day or simply someone you love, I hope this tutorial will inspire you to get crafty! Thanks for stopping by! This entry was posted in Treat Container and tagged container, DCWV, heart, treat, valentine's day by Scrappy Canuck. Bookmark the permalink.